ITEM DETAILS: Meredith Costain will provide a written assessment (including tips on manuscript format, choosing and approaching publishers) of a picture book text of up to 500 words. ITEM: One author signed copy of the picture book ‘No Noise at Our House’ written by Meredith Costain and illustrated by Christina Booth. you come to our house. There are animals living here. want to wake them up. 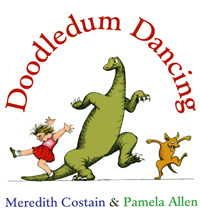 ITEM: One author signed copy of the picture book Doodledum Dancing written by Meredith Costain and illustrated by Pamela Allen. Brief Bio: After finishing school and university I taught English for a while in the country (more cows!) then travelled around the world to places like Siberia, Morocco and northern Sumatra. I started teaching again in Melbourne, played in a few rock and blues bands, and wrote more stories, which were published in Pursuit, Challenge and Explore magazines. After a fight with a car while crossing the road in Paris (the car won) I decided what I really wanted to do was become a full-time writer. So now that’s what I do! Lots of my books contain the two things I like the most: music and dogs. Some of them, like Musical Harriet, have both! These days I live in an old bluestone house in the inner-city with my partner, children’s author Paul Collins. We have heaps of pets: a kelpie cross named Jack, a red heeler called Molly, Harriet the cat, five chooks, inside and outside goldfish and several stray possums, lizards, flying foxes, parrots and bush rats. Besides writing, I love sleeping, reading, eating chocolate and playing blues piano.